This portrait of His Holiness the Dalai Lama was photographed at the Kalachakra Initiation Ceremony, held at Rikon Monastery in Switzerland in 1985. His Holiness is seated upon his throne with his fingertips joined together in prayer as he holds his ritual implements of a vajra and bell in his right and left hands, symbolizing the union of skilful means (vajra) and wisdom (bell). 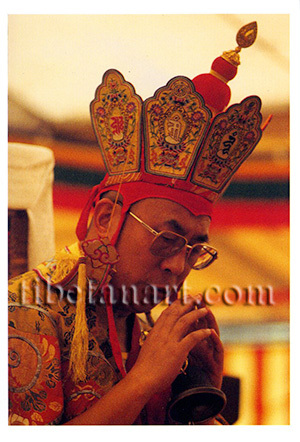 He is attired in the ceremonial brocade robes of the deity Kalachakra and wears a crown that represents the Five Buddha Families. This crown has five aura-shaped panels, each of which bears the 'seed syllable' (bija) and deity symbol of one of the Five Buddhas. Surmounting the crown are the two symbolic topknots of the deity Kalachakra, with the symbol of a wish-fulfilling gem at its top.